Watershield leaves are light green on the top and brown and slimy on the bottom. From the surface, Water Shield can be identified by its small elliptical leaves and dull red colored flowers. The leaves are a bright green on the top, and a reddish-purple on the bottom. The stems that are attached to the center of the leaves are also a dark reddish-purple color. The underside of the leaves has a distinctive slime that also coats the stems. 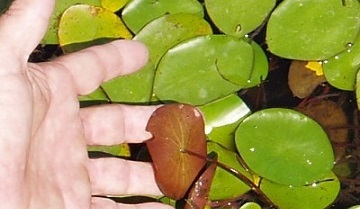 This plant is unlike Water Lilies, which have larger leaves with a notch and are not slimy on the underside. This plant is common in the eastern border of Minnesota, down to the southeastern part of Texas, stretching all the way across the east coast states. They are also common along the border of the west coast. These weeds can be treated using our Cattails and Waterlily control products. Glyphosate 5.4 and a surfactant. You can learn more or purchase these products on our website.